I was born on Tuesday 9th November 1971 in the district hospital Schaffhausen. I grew up together with an elder and a younger brother in Hofen, a very small village in the canton Schaffhausen (look on the map), where I'm still living. My mother tongue is German (Swiss dialect more exact). I attended the primary school for 6 years in the central school »Unterer Reiat«, after that I went to the secondary school in Thayngen for three years. After that I started my professional career with a four-year apprenticeship as a engineer draughtsman in the group of companies George Fischer AG in Schaffhausen where I worked for three years afterwards, until I came to the Fachhochschule Aargau as a student. Since the begin of my study (November 6th, 1995) I belong to the big group of the Internet freaks and hackers as well. My computer hobby began with the ancient »bred box« called Commodore C-64 (1985) with the built-in BASIC interpreter V2.0. I developed a lot of small programs and simple games, most of these programs were interesting graphics experiments. Later, when the CPU speed and the memory size had become too small, I bought a Commodore Amiga 500 on which I wrote a lot of small programs with the included AmigaBASIC interpreter. Meanwhile, I work with a NoName Pentium that I write my programs with the included QuickBASIC in MS-DOS 6.20. People who have similar interests should send a mail to me! Thanks! Let my three most trusting pet friends say something about themselves on their own. 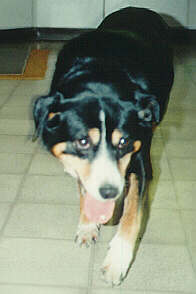 I'm the family dog called »Bianca«, a female Entlebucher dairyman dog. I was born together with 5 other puppies, one of them was also female, at farm »in der Hub« in the Emmental on Wednesday 15th February 1989. On Saturday 20th May 1989 I could take a seat on the car's back seat next to the elder brother of Andreas until Hofen. Since then I can walk a lot and I always draw my master's attention to strange people what he appreciates very much. Although I also like some caressing units a any time. Unfortunately my joints are not in best conditions any more since my knee-operation which was necessary as I tore the crucial ligaments in both legs. 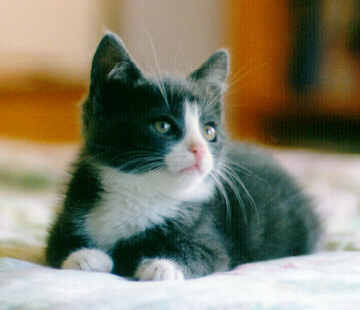 I'm »Zacharias«, a merry tomcat. 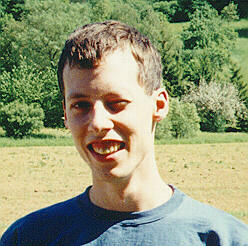 I saw the light of day in the middle of May 1997 in Opfertshofen SH. 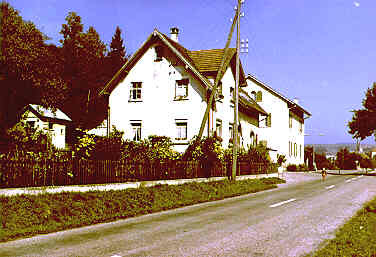 I lived there in a barrel together with two brothers and sisters with the Bührer family. On Friday, 20th June 1997 at once a strange man came and put me into a funny looking cardboard box. After 10 minutes, when I was let out, I found myself at the Meile family in Hofen. I met there my new friend Dimitri who just arrived one day before me. He was a very emaciated creature, what changed very soon. 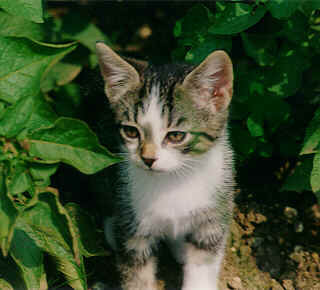 Meanwhile I settled down well and the human being Andreas often calls me »s'herzig Tigerli« (delightful little tiger). He probably says that because I have such a funny spot on my nose. My favourite activity is to play with Dimitri. When I'm tired, I lay down and purr, especially, when a human comes and caresses me. I was also born in the middle of May in Opfertshofen SH. Sometime, my mummy carried us small babies into the barn of the Steinemann family. A little later she took my brothers and sisters to another place, but she simply forgot me. Mew! :-( I got nothing to eat and to drink for three day so I was nearly staved to death. Of course, I squealed like a stuck pig. On June 19th, the human being Armin came into the barn and searched me because of my screams. Because I didn't know what he wanted, I ran away from him. Nevertheless, he caught me behind a bale of straw. He took me to Hofen where I got a big portion of milk. Since then, Andreas' mother feeds me wonderfully, so I'm a lively little tomcat now. The next day, jolly Zacharias, who is my best friend now, arrived. We have got completely different characters, that's because we aren't brothers. I enjoy playing with any kind of items, especially with this tricky Darda® wind up toy car. In memory of the former pets, there's the memory page of my earlier pets. You will see Dimitris' and Zacharias' predecessor at the moment.